Please feel free to enlighten us with any information that you may have of this lovely little building. Feel free to make any comments either on this website by clicking on the “Write comment” below or by logging onto my Facebook Page – Click on the image for a larger view. ← The Former Douglas Fire Station In John Street in Douglas. Manx families were encouraged to invite cadets home for Sunday tea. My mother says everyone was terribly upset when the St George was sunk. David – HMS St. George may have sunk metaphorically – but not in the oggin. HMS St George was the name of the ‘stone frigate’ training base on the Island, whose new-entries were billeted in the holiday camp. Thanks David, obviously loads of history surrounding this place..
David here is some further information which hopefully can assist with the history of this building! 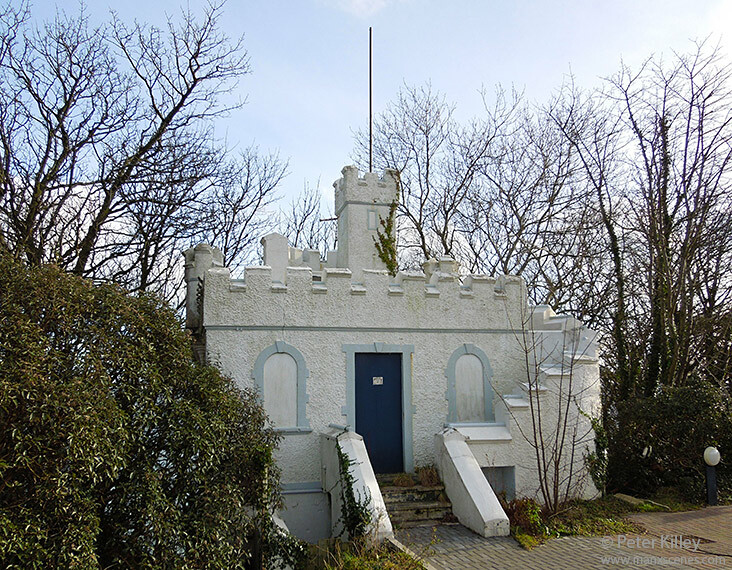 This building is a toilet block and was built for Cunninghams camp which at the time was men only, the stairs and door in the centre lead to a wash and bathing area and the steps down to the left of the door led down to the toilets.About two hundred yards to the left of this building through some bushes can be found the remains of the chair lift that led from the bottom of little Switzerland up to the level of the campsite. Stayed here many times with my mum and dad my memories are of the palm house going with my dad in a morning for the tea tray to take back to the chalet .reg the swimming instructer who gave me lessons but i could do the actions on the side but afraid to go in the pool .the escalter down to switzerland rd to the frontage and back up again plus the castle type entrance wish we could go around the place again happy days of the late 50s early 60s .